When I was in high school, Taylor took piano lessons with me. Her parents have always been avid supporters of me and of my dreams. So when I announced that I wanted to write custom songs for people, Haryl decided to surprise Taylor with a custom song for her Christmas present in 2011. I was thrilled. Taylor and I discussed her desire for her “theme song” and I got right to work developing her anthem! She wanted something positive, upbeat, and about living life to the fullest. The song was written in early 2012, and then… I GOT ENGAGED. Production of the song was put off for a year while my husband and I transitioned to married life, then I had a vocal injury which lasted for several months! Now, two years later, I decided to produce Hearts Beat with Kyle Novy of My Song Alive as one of my first projects with him as MelodyWed™ and give it to Taylor on the two-year anniversary of the project, for Christmas. Taylor wanted to sing with me on the song, so we recorded vocals on Thanksgiving Day in my parents’ basement while our families were together celebrating merrily. You can hear Taylor’s pure, clear voice on the high harmonies in the choruses. Below left: Taylor and me during a piano lesson circa 2005. 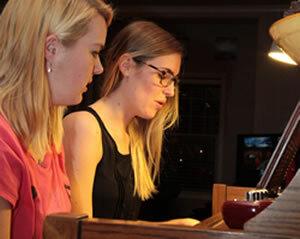 Below right: Taylor and me practicing Hearts Beat on Thanksiving Day 2013. 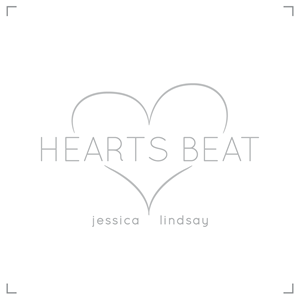 Please enjoy the preview of Hearts Beat. Taylor likes alternative rock bands like Imagine Dragons, so I wanted the sound to be pulsing, intense, and emotional. And of course for a song called Hearts Beat, we needed some BOOM BOOM drums. For her ideal theme of living life to the fullest, I envisioned youth, fleeting, beautiful, and full of vitality. I imagined dancing barefoot in the dust, nights under the stars singing with full hearts, and learning how to love. The lines in the chorus beginning with “Let’s” are meant to evoke emotion and spark action. “Let’s live,” “Let’s run,” Let’s dance,” “Let’s sing,” and all to the fullest. To my surprise, Taylor also requested a key change! Within this song, I think the key change is powerful and takes the meaning to another level — it was a great idea. Seeing Taylor sing the song I wrote for her and be moved by its words is truly a gift for me as the songwriter. Something I helped breathe into creation has impacted another person and I hope it touches many more.